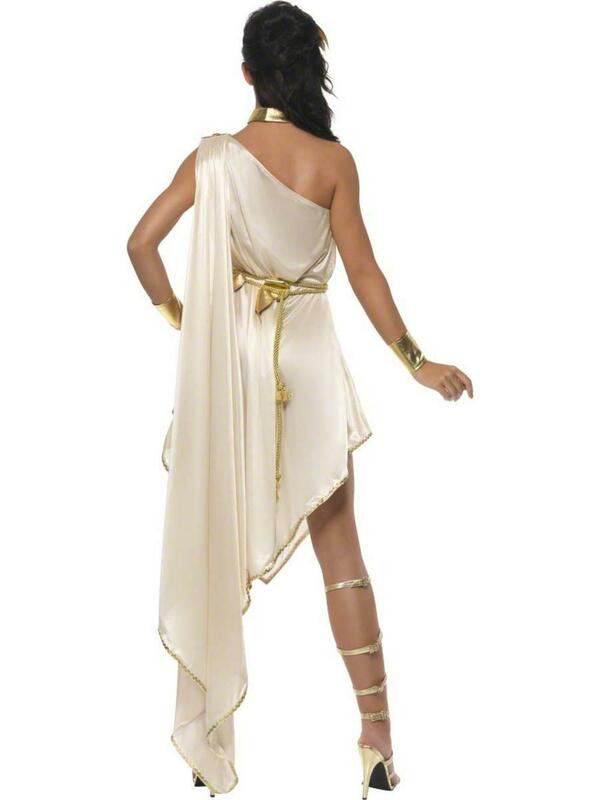 Transform yourself into a beautiful Grecian or Roman Goddess and impress all the mere mortals at any fancy dress party with this beautiful Fever Goddess Costume. Included is a beautiful off the shoulder ivory coloured dress made from a shimmering satin like material and decorated with silver and gold coloured trim, a gold coloured rope belt decorated with a bow and a pair of matching gold coloured arm cuffs. Completing this beautiful costume is a thick gold coloured choker necklace and an ivory coloured headpiece decorated with an attached gold bow. Perfect for any Greek or Roman themed fancy dress party. Ivory headpiece with attached gold bow.